Low-angle self-portrait of NASA's Curiosity Mars rover on lower Mount Sharp. Wheel design for the Mars 2020 project includes modifications to increase durability over harsh Martian terrain based on lessons learned from operational use of the wheel design of its predecessor, the Mars Science Laboratory Curiosity rover. The Mars Science Laboratory (MSL) rover wheel design has proven susceptible to premature wear over certain types of Martian terrain. The anomalous wheel wear suggests that dynamic loads and terrains representative of actual operational conditions were not adequately simulated during life testing in the Mars Yard outdoor test facility at NASA’s Jet Propulsion Laboratory (JPL). The wheel was designed with very limited knowledge of the specific terrain features that would be encountered during Mars surface operations. In October 2013, approximately 14 months after the Curiosity rover landed on Mars, images from the Mars Hand Lens Imager camera on the rover’s robotic arm revealed wheel damage. Wear and tear is expected, so the wheel skin puncture did not initially raise a concern. However, subsequent visual inspections revealed higher than expected wheel wear, which prompted JPL to begin tracking the progression of wheel damage. Progressive damage to the wheels continued and was attributed to single-event punctures as well as metal fatigue, due partially to the prevalence of ventifacts embedded in immobile, wind-eroded, pyramidal rocks, or protruding Martian bedrock. During wheel testing the MSL project had placed more emphasis on loads from the touchdown impact during landing — the expected worst-case wheel failure mode — than on terrain-influenced driving loads. The MSL project implemented corrective actions to mitigate the extent of damage, which included establishment of guidelines for assessing wheel wear progression and minimizing wheel wear while driving, based on visual observations of the rover on the Martian surface and verification in the Mars Yard. Driving backward on “wheel-hostile” terrain to reduce the load on the front wheels and avoiding driving over hard surfaces with a high concentration of sharp ventifacts has proven effective in managing the rate of damage. Despite this unanticipated wear, MSL has completed its primary mission and is expected to successfully complete its extended mission. The MSL project implemented operational measures to minimize further damage, and the wheel design for the Mars 2020 project is being modified to increase durability over harsh terrain while preserving tractive performance in loose media on the Martian surface. The design maxim of “test as you fly, fly as you test” was not adequately heeded. Because the MSL wheel was life-tested at the single-wheel level, only the static weight of the vehicle was simulated — not the dynamic mechanical loads that exert a downward force on the wheel. In addition, the wheel was life-tested over smooth, artificial terrain that underrepresented the wind-sharpened bedrock encountered on Mars, and testing did not account for the impact of rock immobility. Analytical modeling and testing of mobility systems need to expand on the range of load cases to encompass the evolving understanding of worst-case operational environments, with margin. Challenge your assumptions. MSL’s relatively slow speed across the Martian terrain led the project to focus on wheel design for semi-static loads, which are consistent with testing with a single wheel. Achieve consensus. During Phase A, ensure that the project team agrees to a common definition of the worst-case surface terrain configuration. Provide margin. If you don’t understand an environment, provide “well-margined” capabilities to encompass the worst case. Mitigate the overall risk of planetary missions through (1) rigorous assessment of the major known environmental risk contributors, and (2) provision of design capabilities to counter critical environmental risks at the upper bounds of their probable severity, with substantial margin. Consult the lesson learned for complete lists, including a set of technical recommendations specific to future rovers. If we knew precisely what we will encounter in deep space, would we have any reason to explore it? One of the most daunting challenges of space exploration is predicting the worst-case operational environment the mission must withstand so the team can design (with added margin to encompass uncertainty) a spacecraft capable of surviving it. The wheel designer must predict not only how “pointy” the rocks are at the foot of Mount Sharp, but also the mechanical properties of the rocks. The premature wear of the Curiosity rover wheels on Mars also illustrates the difficulty of strictly following the principle of “test as you will fly.” A simulation is only an approximation of the conditions that are the subject of a system test. Although the Mars Science Laboratory mission has been fully successful, this lesson learned points to the need to always challenge your assumptions. 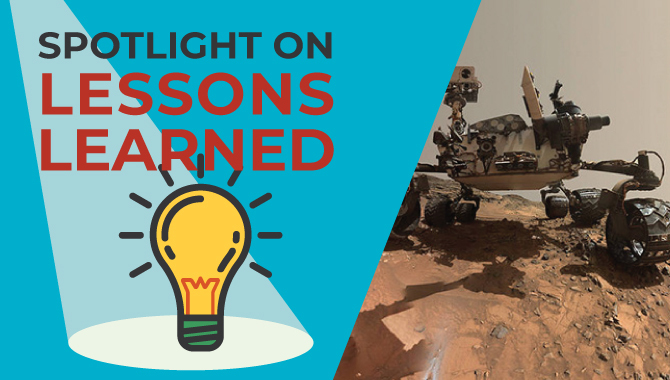 Spotlight on Lessons Learned is a monthly series of articles that feature a valuable lesson along with perspective from NASA’s knowledge management community on why the lesson is important. The full lessons are publicly available in NASA’s Lessons Learned Information System (LLIS). If you have a favorite NASA lesson learned that belongs in the spotlight, please contact us and be sure to include the LLIS Lesson Number.